A talent tug of war? The big prize. The opportunity of a lifetime. The largest single roll of the dice in U.S. economic development history. All the superlatives were trotted out as Seattle-based tech giant Amazon pondered where to put its second headquarters (HQ2). In the end, Arlington County in technology-rich Northern Virginia and the Long Island City neighborhood of Queens in New York City, divided the spoils. Amazon says the 25,000 or so jobs it will create in each location will pay an average of $150,000 a year. The ripple effect of Amazon’s presence in Virginia will amount to $14.2 billion and more than 59,000 jobs over a dozen years, according to a study for the Virginia Chamber of Commerce conducted by Richmond-based Chmura Economics & Analytics. In competing for HQ2, Virginia rightly decided that monetary incentives were not the most important issue for Amazon. What really mattered was Northern Virginia’s pipeline of technology talent and major educational investments to train more workers. But questions persist about the effect Amazon’s arrival will have on existing employers. These companies wonder whether the pipeline will be big enough to satisfy everyone’s needs. Some of those companies are among the Best Places to Work in Virginia. Since 2011, Virginia Business and Pennsylvania-based Best Companies Group have collaborated to identify top workplaces in the commonwealth. At least 30 of the 100 companies on the 2019 list of the Best Places to Work are involved in technology or government contracting, and about 50 are based in Northern Virginia. Already recognized as being highly desirable workplaces, what will these companies do to continue to attract the workers they need? Officials from Best Places companies acknowledge that the competition for talent in Northern Virginia could become fierce when Amazon begins to staff its National Landing headquarters, which will include parts of Arlington and Alexandria. Rosenthal believes that HQ2 will initiate a cultural shift that will remake the region and change its identity. “It will make the business of D.C. no longer government. The business of D.C. will be Amazon,” she asserts. Rosenthal acknowledges that Amazon could greatly expand what she calls Northern Virginia’s “innovative gene pool.” The problem: “We’re not going to be able to afford guys,” she says. For Rosenthal, the one bright spot is that the value of the condo she owns in Arlington already is soaring because of Amazon’s announcement. She hopes that when she finally decides to put the condo on the market, the price it commands will be over the top. “Maybe I’ll be able to retire on my condo,” she says with a laugh. John Braun agrees that Amazon will be a formidable competitor for talent. 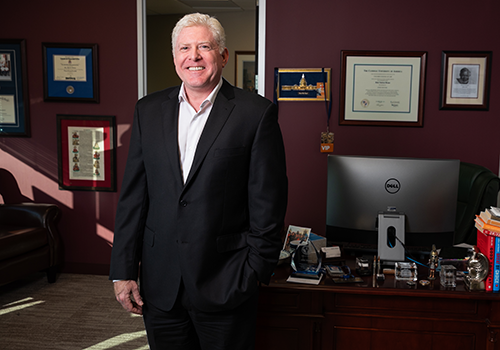 “That’s always a concern, but it’s a good problem to have,” says the president of Dynamis, a Fairfax-based company providing a broad range of services and support to government clients. Braun says companies already facing challenges may be more vulnerable when competing with Amazon than firms that have grown, even in difficult times. He is impressed with the state’s education investment proposals, which are designed to ensure that a large number of qualified workers will be available not only to Amazon but to others. His company is continually investing in its employees’ education and training, whether they want to get a master’s degree, a doctorate or a certification in a critical area. “To be successful in the long run, you have to spend money,” Braun says. If his company gets in a bind in trying to keep a particularly talented employee, he says, “we would offer additional benefits,” on top of what he believes is already an attractive compensation package. Jeanette Chapman, deputy director of the Stephen S. Fuller Institute for Research on the Washington Region’s Economic Future at George Mason University, sees both sides of Amazon’s possible effects on the Northern Virginia talent pool. On the other hand, “the countervailing point is that Amazon will be a big enough name to attract a significant workforce on its own,” Chapman says. “One thing Amazon could actually do is create a new reason to attract and retain young workers. Amazon would be a draw in that respect. We seem to have difficulty retaining the younger talent. It seems to be a little more acute in the past few years than it has in prior decades,” she adds. Analysis by the Fuller Institute found that the number of 25- to 34-year-olds living in Northern Virginia fell in 2015 and 2016, despite growth in that population group nationally. Northern Virginia also has lost federal jobs in recent years as a result of a drawdown of troops in Iraq and Afghanistan, budget cuts and other factors. In 2010, the Fuller Institute says, 39.8 percent of the Washington region’s economy was generated by the federal government. By 2017, that figure had fallen to 31.2 percent. The decrease accompanied an overall decline in regional economic activity, even though the number of private-sector jobs increased. The jobs created by Amazon — and firms that may cluster around HQ2 — could underpin and sustain the region’s economic recovery, Chapman believes. Another big factor in the regional economy’s future will be additional investment in education: more than $1 billion during the next 20 years. The goal is to produce an additional 25,000 to 35,000 bachelor’s and master’s degree graduates in computer science and related fields. Major players in this ramp-up will be Virginia Tech, which will receive $250 million from the state that will be matched by funds from the university, and George Mason University, which is getting $125 million in state funds with a university match. At GMU, the money will be used to expand the university’s Arlington campus while emphasizing research and graduate education in technology. Virginia Tech, whose main campus is in Blacksburg, plans to create a 15-acre, $1 billion Innovation Campus within two miles of Amazon HQ2. Brandy Salmon, Tech’s chief operating officer for the Innovation Campus, is bullish about the university’s role in filling Virginia’s tech talent pipeline. “The Virginia Tech Innovation Campus is an ideal solution — right university, right programs, right time and right location to transform and sustain Northern Virginia and the entire region as a leading magnet for tech talent and innovation — with room to grow, adapt and evolve as technology and the market changes,” Salmon says in an email. “At scale, we will enroll 750 master’s degree candidates and train hundreds of doctoral students and postdoctoral fellows,” she says. The buildout for the Innovation Campus is expected to take 10 to 15 years. Besides new students in Northern Virginia, the university expects to add 2,000 undergraduate students who will study software engineering and computer science at the Blacksburg campus. Meanwhile, Deborah Crawford, GMU’s vice president for research, says the university is committed to doubling the number of undergraduates in its computer science, cybersecurity and related fields to 10,000 students by 2024, adding that the state will help it increase its number of master’s degree students in those fields. “Families in the commonwealth understand that the job opportunities in these fields are plentiful,” Crawford says, adding that Virginia alone has about 35,000 unfilled jobs in the tech sector. In the end, Crawford is confident that Virginia’s efforts to create a pipeline of technical talent will be successful. Bobbie Kilberg, president and CEO of the Northern Virginia Technology Council, says her members continually struggle to acquire and retain talent. She adds that Amazon’s HQ2 announcement already has benefited the region. “We have tried for as many as 20 years to define this region as a global technology center full of innovation and entrepreneurship,” but only a few people were listening, Kilberg says. Now that identity is an accepted fact. “In terms of branding, it’s fabulous,” she says.